Mysore is a tourist destination that is bestowed with scenic as well as architectural beauty which is then adorned with colourful vibrancy of ages old culture and traditions. 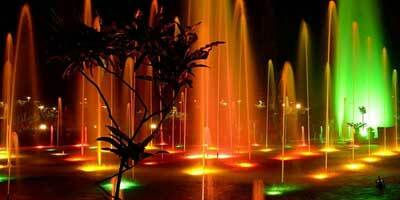 If you are looking for a day of utmost fun and entertainment then go for a Mysore city tour. This historical city, which is also known as cultural capital of Karnataka, offers a wide array of sightseeing places. These sightseeing places in Mysore, ranging from serene lakes and parks to museums and art galleries, dams and zoos to temples and churches, caters to varied interests of travellers. No sightseeing in Mysore is complete without a tour to various palaces. Owing to the grand palaces that are located in Mysore, it is also known as the City of Palaces. However, visiting all these places require a lot of planning, and information on the visiting hours, entrance fees and so on. At Holidays DNA, we offer Mysore City Tour Packages by Bus & Cab, making it hassle free for you to have a Mysore city tour. With our city tour packages to Mysore you can be sure of having a memorable tour of Mysore city without any stress of arrangements or planning. Our travel experts have created a wide array of Mysore City Tour Packages by Bus & Cab so as to suit varying travel requirements and preferences. The tour package includes an exclusive cab or bus based on your preference and budget. Depending on the number of passengers a suitable vehicle for sightseeing is offered. This package is inclusive of driver fees and parking charges as well. With our city tour package, you can explore the unparalleled charm of Mysore city at your own pace. Some of the places within Mysore that must be visited are Mysore Maharaja Palace, Mysore Zoo, Lingabudi Lake, Jayalakshmi Vilas Mansion, Karanji Lake, Brindavan Gardens, Chamundeshwari temple, Lalitha Mahal Palace, Jaganmohan Palace, Melody World Wax Museum, Mysore Rail Museum, Krishnaraja Sagara dam (KRS Dam), Jaganmohan Palace Art and Gallery, Sri Ranganathaswamy Temple, St. Philomena’s Church, Ranganathittu Bird Sanctuary, Chamundi Hills and Kukkarahalli Lake. You can visit all these or select a few, depending on your interest and time. Whether you are interested in architecture and history, looking for some time amid nature, searching for some activities to do over the weekend or just want to have photography tour, you will find ample of options in Mysore. With these city tour packages, you can visit various landmarks in the city, popular sightseeing places, shopping hubs, eat-outs, etc. We try to offer a complete experience of Mysore through our tour packages. In addition to various facilities, we also offer tailor-made Mysore City Tour Packages by Bus & Cab. So, if in case you have any specific requirement you can inform our travel advisors who in turn will create a package exclusively for you and travelling partners. From educational tours, college or school tours, family city tour, romantic outing to a group tour with colleagues, we have city tour packages for all.